The book Total Transition: The Human Side of the Renewable Energy Revolution offers an in-depth look at the social and environmental impacts of the current fossil fuel energy system, and calls for a renewable energy transition, which takes into account the needs of those communities that have been most affected by this system. 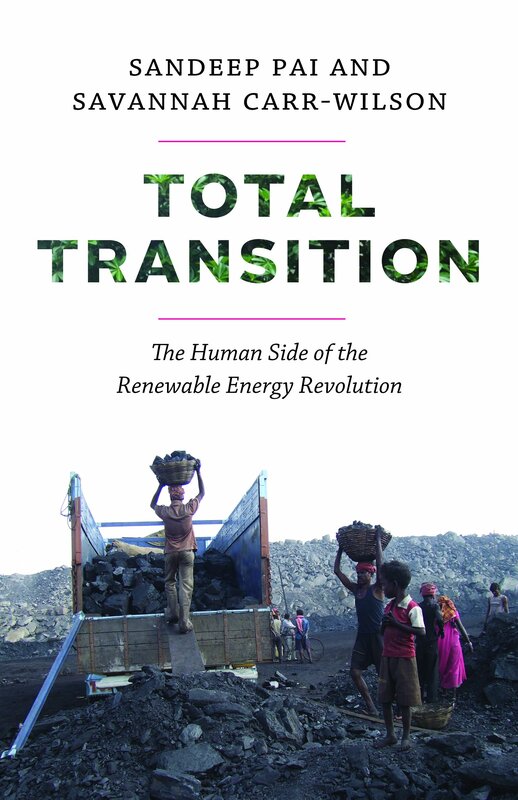 In their recent book Total Transition: The Human Side of the Renewable Energy Revolution (2018, Rocky Mountain Books Ltd), the authors Sandeep Pai and Savannah Carr-Wilson explore the issue of energy transition from fossil based to a renewable zero-carbon system, focusing on the human dimension. The book is an important contribution to the work on environmental justice and on “just transition”. The couple visited various places around the world exploring the dependency of whole communities on fossil fuels, and trying to envision the future of these communities during the energy transition. Various issues of environmental justice are unfolded as the authors travel in conflict areas and come across the testimonies of people who live and work close to the coal mines in India and to the oil (tar) sands in Canada. The term of environmental justice was introduced to explain the phenomenon of the poor disproportionately facing the negative health outcomes of hazardous environments. This can be seen between nations, as often the poorest nations burden the cost of the affluence in Western societies, or within the same nation where rural populations or other disadvantaged groups burden the social costs. Especially fossil fuel energy resources, which are unevenly distributed, have traditionally created patterns of violence and inequality. The marginalized groups often lack of representation and recognition and their stories are rarely heard. This book covers this gap by exploring the stories behind the people who live and work close to the oil extraction sites. Jharia is one of the main engines in the rapidly growing economy of India, a growth that is being achieved at great environmental and social costs. The resources in the area have been over-exploited to meet the rapidly increasing needs and aspirations of the affluent sectors of society, while the local population is left with polluted air and a couple of dollars. 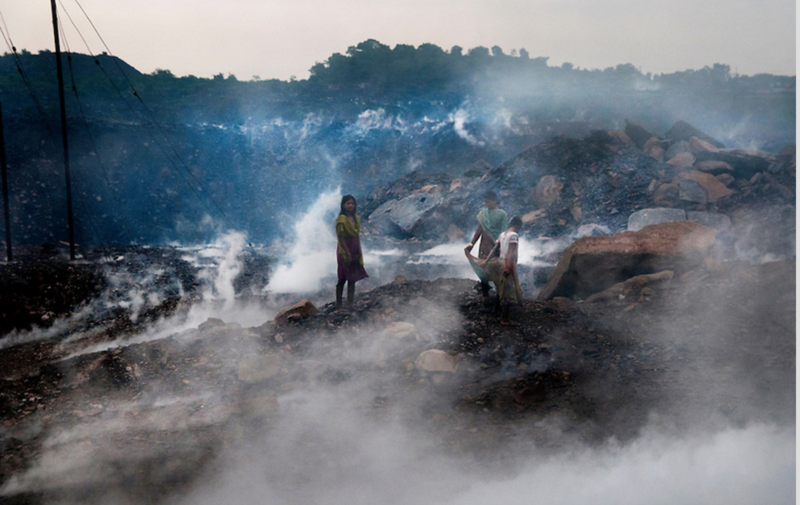 Women and children scavenge for coal in the Jharia coal mine, which has repeatedly caught fire because of the lack of regulations. Source: pgeproject.wordpress.com. Indeed, governments don’t pay attention to the needs of those poor, uneducated marginalized people, especially as long as the topic stays away from the media. However, the issue of Jharia gained international attention due to movements and global press coverage. As a response, the Indian government started a program of relocation of the population in the nearby city of Belgoria. The Jharia Rehabilitation and Development Authority (JRDA) is responsible for arranging the relocation. The living conditions in Belgoria are equally bad –not to say worse— due to lack of employment, and the limited houses available, which are old and structurally unsafe. The process of relocation has been slow and most of the people interviewed in the book chose to stay in Jharia, because there they can at least work, have a house and cover their basic needs. Tar sands in Canada. Source: mining.com. In both cases, an interesting question raised by the authors is how the phase-out of fossil fuels will affect these communities that seem to be totally depended economically upon the mining activities. Indeed, the fossil fuel sector is already changing dramatically: big companies are going bankrupt, retiree benefits are under threat, and the salaries are getting lower. Barrett, in his research back in 2001 observed a decline in the coal mining industry due to automation and mechanization. The situation is even worse with the introduction of climate change policies and a stricter focus on an energy transition. For instance, a study conducted by Stanford University in 2015, estimated that 3.86 million jobs in the current fossil industry in the USA will be lost due to the transition to renewable energy production. And, although coal and oil are increasingly being replaced by alternate energy sources, there is little forethought about the fate of those communities where the fossil fuel industry has shaped the way they live, work and play. An artistic description of some of the ideas behind a just transition. Source: ecology.iww.org. Dealing with the issues of environmental injustice in the present fossil fuel economy is a significant challenge. 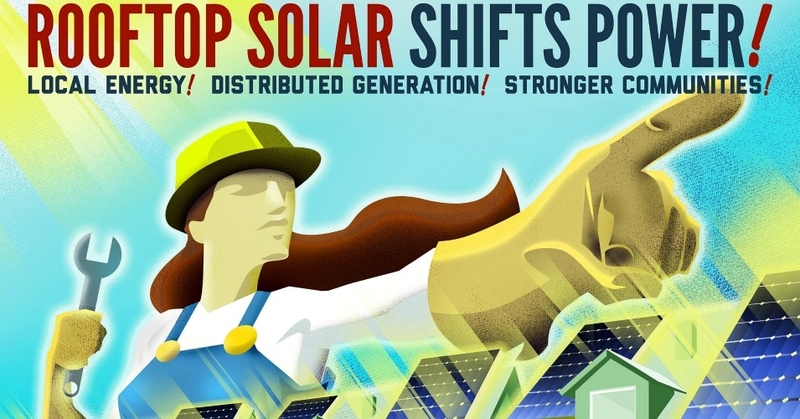 An even bigger one is to ensure that the strategies to transition away from fossil fuels won’t fall into the same path of the exploitation, violence and dispossession embedded in the current political economy. And the first step in this direction should be to recognize the social and environmental consequences of the present system and to emphasize those environmental and social justice elements during the transition. The term “just transition” was introduced to describe the social context of the energy transition and more concretely, the actions needed in order to secure jobs and income during and after the shifting to the sustainability era. Nowadays, many organizations like the Just Transition Alliance, the Climate Justice Alliance and the International Trade Union Association Confederation have brought these issues into the international scene and call for a “just transition” in order to deal with the social impacts of restructuring the current carbon-intensive economy. Where job losses are unavoidable, concrete and robust policies should initially protect and compensate people and then secure their relocation to new, decent jobs in the new low-carbon economy. For this to become reality the current policy design should also focus to the peripheral sectors of energy in order to create the much needed adaptive capacity. The climate justice, environment and labor movement should work together towards a “just transition”. In the book, the idea of renewable energy communities is briefly brought up as an alternative that can create a new era. In these communities, people will have democratic control over energy and potentially achieve self-sufficiency and autarky. The authors also present some interesting examples of just transition in practice like the city of Essen in Germany where the old coal mine was converted into cultural space, or the city Liulong in China where the abandoned coal extraction site was transformed into a solar park. These projects employ people from the old mines which now enjoy better living and working conditions. After reading the book, there remains no doubt that the old energy system which for the past century fueled an endless economic growth on a finite planet, has sucked the life out of local communities who found themselves trapped in a regime of environmental injustice. And these examples are not the only ones. One can find numerous similar cases of environmental injustice around the world including villagers in China suffering from exposure to toxic gases from chemical plants, people in African Townships with respiratory problems after burning coal indoors; and coal miners around the world who are suffering from black lung disease and lung cancer. 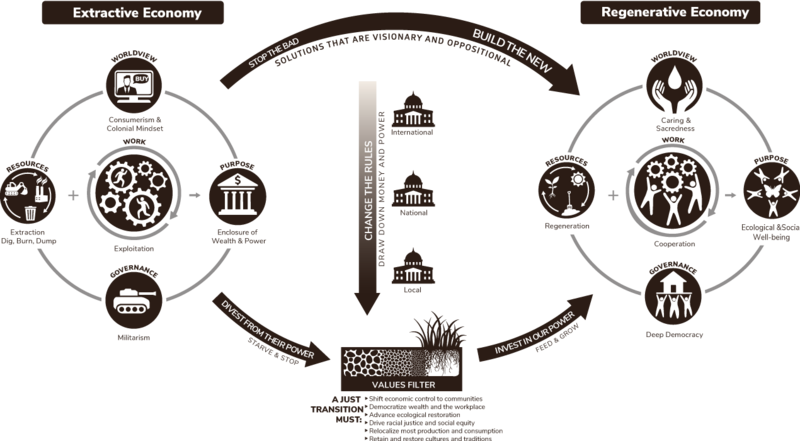 So, coming back to the question of the book, what is the “human side” of an energy transition? It’s a model of transition that should not only include advanced energy technologies, new policy frameworks and modern institutions. It is a model that should be based on fairness and inclusiveness. To achieve that, a broader change in social organization is needed. In other words, the challenge is not simply what fuel to use, but how to organize a new socioeconomic system around that fuel. Who gains, who pays, who benefits, to what cost, who suffers and in what ways, are some of the main questions around which the new system should be organized. 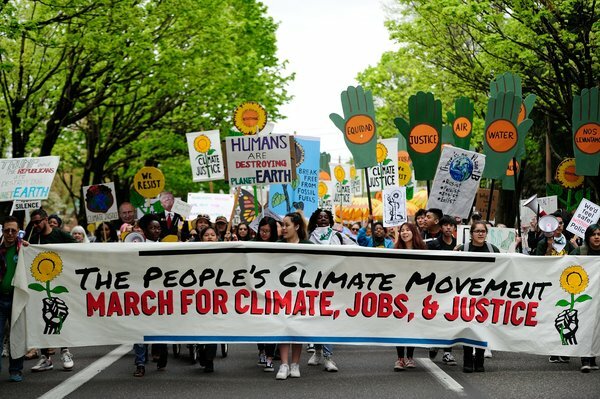 The People’s Climate Movement (here during the People’s Climate March in Portland, US on April 29, 2017) calls for climate justice and a just transition where climate is linked with jobs and justice through a systemic transformation. Their slogan: system change, not climate change. Source: Alex Milan Tracy/opalpdx.org. Marula Tsagkari is a PhD candidate at the Autonomous University of Barcelona, working on renewable energy transitions, decentralized energy communities and energy democracy.